The sun has been out in all it's glory here in the UK, which means that we've taken out the garden furniture from storage in the shed, and have started to turn the garden into somewhere nice to sit and relax. It's taken a while for us to get to this point, and in truth we still need a new table and chairs, but I think for this year, we can use what we have before investing in something new. Like many, our budget is a little tight at the moment and this year we're working extra hard to be resourceful and use and improve what we already have. We've invested in some spray oil to feed the chairs and table so I'm hoping that once they've been sprayed with the oil, they will look a little less forlorn. Perhaps a few crocheted cushions won't go amiss and would brighten up the garden as well as depleting my yarn stash. I must admit that I'm not a keen gardener. If you ask my husband, he will quickly tell you that he can't get me to help with the gardening 'for love nor money'. The fact that we have a great selection of plants that are now giving us privacy, is all to his credit. I have all the excuses in the world - and all of which are not 'real' excuses. 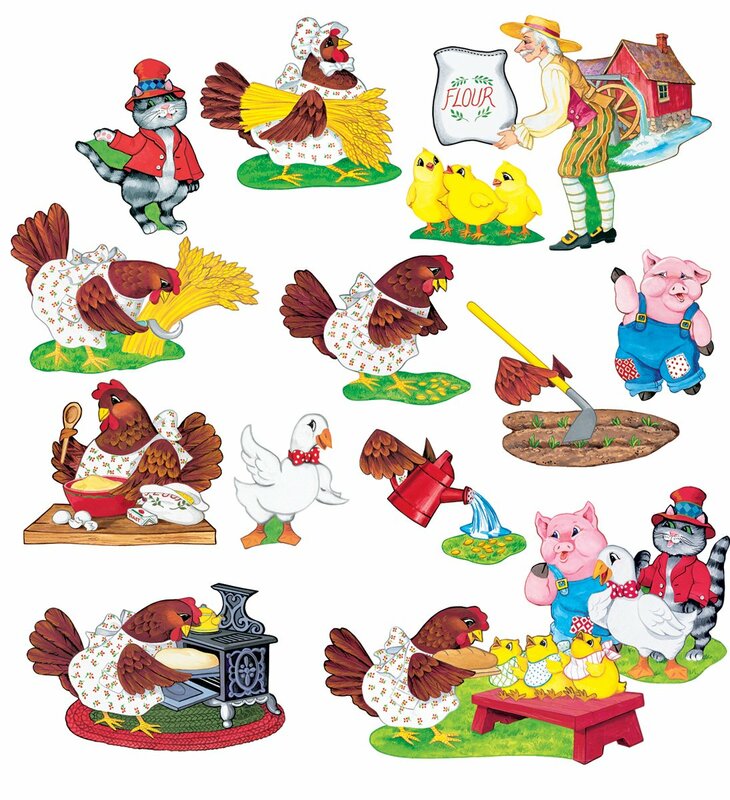 In fact, it's a little bit like 'The Little Red Hen' - have you heard the childen's story where the Little Red Hen has some wheat that she wants to grind into flour and make bread. But nobody will help her so she does it all herself. The story takes you through the different stages of bread making and ends with a beautifully baked loaf by The Little Red Hen. Then all of her friends want to eat the loaf, even though they wouldn't help to make it. Well I think my husband is the Little Red Hen and I'm one of the lazy friends who wouldn't help. Whilst I love to sit and enjoy the garden, I don't want to help maintain it. Just to balance things out though, I will always do the housework when hubby is gardening, so that it's fair, and I do love to clean so it works really well for us. Do you have your own preferred jobs? So thanks to Mr. Rowe, I can hopefully take some work outside in the weeks to come and enjoy sitting in my outdoor 'office', listening to the birdsong, the wind rustling through the trees, children playing, lawnmowers chugging, traffic roaring, and all of the noises that are there around us, that we often don't notice. Here's a great mindful exercise for you to try if you find yourself with a few minutes to sit in the great outdoors and knit or crochet. Settle into your seat and place your knitting or crochet down for a moment. Close your eyes and spend a few moments noticing your breathing. As you relax, listen to the sounds that you can hear. Concentrate on the louder, nearby sounds and pinpoint one sound to focus on, such as a birdsong. Listen to it's melody and how the notes are strung together. Breathe deeply as you listen and feel how your body reacts. Try to receive the sound without judgement, without responding. Notice the sound arising and the sound passing. Notice the pauses between the sounds and also note the sound of silence. After a few moments, pick up your knitting or crochet and as you work on your mindful project, continue to hear the sounds around you, noting their comings and goings. Using our senses in our mindful knitting and crochet can bring us into direct contact with the present moment and to what is happening around us. When our senses are engaged, our minds are less likely to find the time or space for thoughts and emotions. You can practice this simple exercise anywhere and it's a great way to train your senses to be aware of the present moment. As you practice this exercise more and more, when you hear a birdsong, you will naturally tune-in to the sounds as your body memory responds. A few months ago, the lovely Sara, owner of my favourite yarn shop, Black Sheep Wools in Warrington, invited me to her 'Mindful' day, at the Craft Barn, to chat with customers about how to practice Mindful knitting and crochet. I was really delighted as I always love a visit to the Craft Barn which is full of everything colourful and crafty, including delicious food and cake (and it's the most delicious homemade cake too with gluten-free options - yum!!). I love to share my passion for knitting and crochet with others and I'm at the point now where I feel really comfortable chatting about anything knitting and crochet related. So now I don't feel as anxious when I'm teaching or talking (which is a relief), so as you can imagine, I was really looking forward to spending a day in the Craft Barn and chatting about mindful knitting and crochet. The main event for the day was a talk by James McIntosh and Dr. Thomas Ernst, all about using knitting as Meditation. James and Thomas are touring with their new book called "Knit and Nibble" which not only contains lots of great knitting patterns, but also lots of recipes for delicious biscuits and cake - what a perfect combination. Their talk was incredibly interesting, heart-warming, sad as well as happy. James openly talked about how he went from hero to zero, practically overnight; from having a huge, successful TV career in China, to not being able to move his legs and get out of bed through acute depression. He talked us through his journey, how he survived with the help of his partner Thomas, and how he discovered knitting, which was a pivotal moment for him. He taught himself to knit, and stitch by stitch he has started to rebuild himself and his life. Dr. Thomas talked about the scientific elements of Mindfulness, and I was captivated by his talk as he explained that we're all born amazing and it's only society that tells us that we're not good enough, or that we need to certain things to show everyone that we're successful and worthy humans. But in reality we're born amazing through billions of years of evolution and we carry all of the historical DNA coding from our ancestors - from that single cell amoeba, to fish, mammals and so on, through to our human form. He explained how our unconscious mind holds all of these memories too, in addition to the memories of our conscious mind (which I was surprised to learn is only the size of a walnut - quite small isn't it!!). He went on to talk about Mindfulness and how it can aid depression and we all practised a mindful body scan. The question and answer session was really insightful as most of the audience either suffered themselves with depression or anxiety, or worked with others or were carers for those who are mentally unwell. It was quite emotional to hear people's stories and journeys, but the common thread that drew us all together was that we all used our knitting (or crochet) as a tool to make us feel more relaxed, calm and positive. I found it quite amazing that just two things could make such a difference to our lives - a simple ball of yarn and a pair of needles (or hook). Isn't it incredible to think that every ball of yarn contains so much hope and love within it, and for James, it literally saved his life. The main aim of James and Thomas is to raise awareness of knitting and meditation - James has called this 'Knititation'. 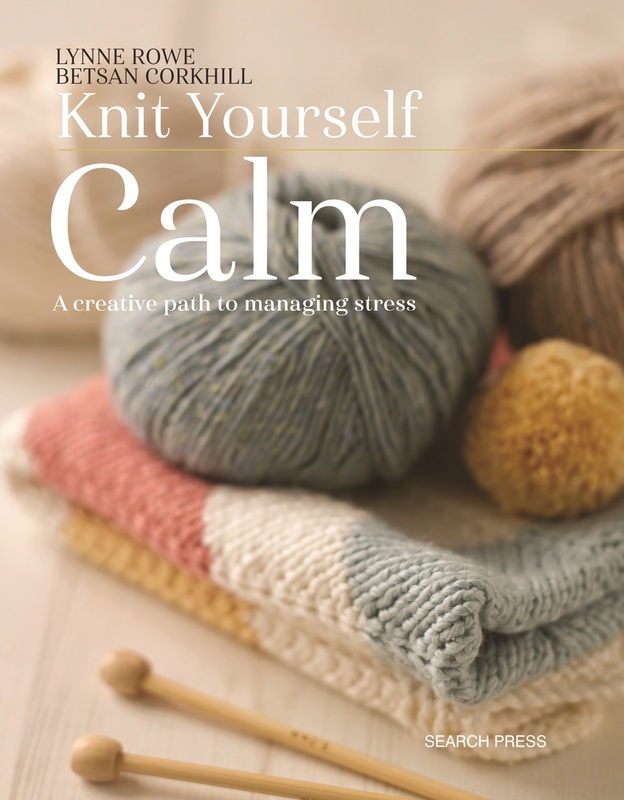 Together, they're hoping to raise awareness and encourage funding to enable full medical research into knitting as a therapeutic benefit for acute depression, which would be amazing, wouldn't it. You can read all about James and Thomas over at Knit and Nibble (www.knitnibble.com). 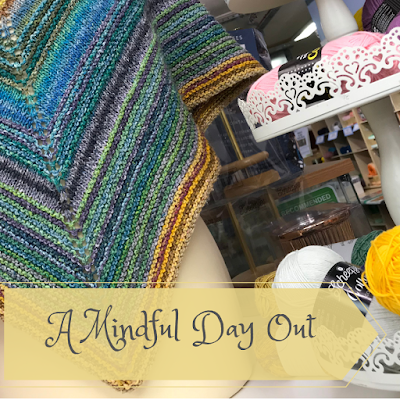 For me, it was a great opportunity to meet James and Thomas, as well as to chat with the all of the lovely customers and talk to them about how to combine Mindfulness with their knitting and crochet. 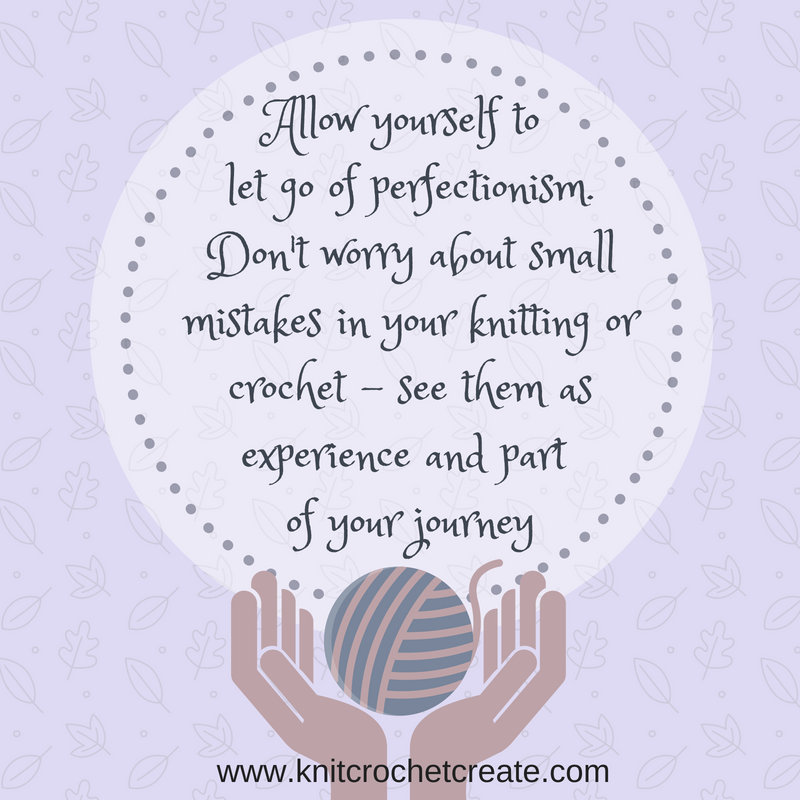 I practice at least 20 minutes each day and combine it with my knitting and crochet and it has helped me to feel much more positive and mentally refreshed. I can honestly say that it’s made a huge different to the way I feel, the way I deal with things and the way I react to stress and pressure. I feel much calmer and ready to face each day, along with the many challenges it may bring. I find that as the rhythmic and repetitive stitches become more familiar, they help me move into a more meditative and trance-like state. As I slow down and unwind, my body reacts by releasing chemicals that are calming and soothing, and as I relax, my knitting or crochet then becomes more enjoyable. In truth, I don't really want to put down my knitting or crochet, but I find that focussing for around 20 minutes each day is enough for me to feel the benefit. I do knit and crochet for much longer each day, but not in a mindful way, but more to just relax and watch TV. Over the coming months I will be sharing some tips with you on how to practice your Mindful knitting and crochet, and if you would like to learn more in-depth exercises, you can come along to my workshops in June (link is below) - an extra date has been added as the first ones have sold out. Thank you to everyone who has booked already and I can't wait to meet you all. 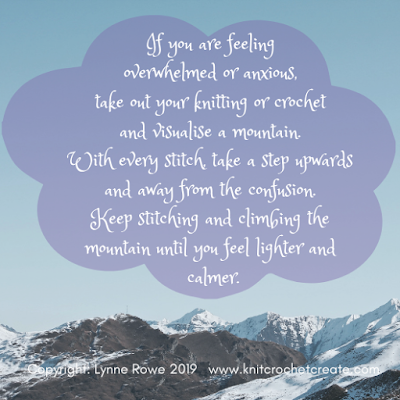 So for now, it's back to the grindstone of life as a new week awaits, full of deadlines, new beginnings and of course, a little bit of mindful knitting and crochet so that I can greet each day feeling as though I have a chance of climbing those 'deadline mountains'. Have a fantastic week, and remember, as Dr. Thomas said "We're all born amazing". Disclaimer: Please note that this post is not a sponsored post in any way. All of the content is my own personal view. Hello everyone, how are you all. It's almost the end of January - can you believe it? Time is definitely flying by this year. I've recorded my January Edit over on Sound Cloud and hope you can find somewhere quiet to sit and enjoy it, with a cuppa and a slice of cake. Disclaimer: Yarn was provided by Black Sheep Wools, Warrington. It’s a work-related WIP as its eventually for Black Sheep Wools and it’s a slightly different/bigger version of my Faithful Shawl, which is a nice, simple and mindful knitting project. It uses garter stitch and an eyelet pattern to create a crescent-shaped shawl. A Whirl has 1000m of yarn per skein/cake and that's a lot of knitting. I really thought I was almost at the end, but then when I weighed the remainder of the cake, I'd only knitted up just over half of the yarn. I was a little bit deflated to say the least. It's never-ending!!!!! Even it if does look beautiful, with it's gentle fading from one colour through to the next. Pattern is Basic Lace Socks by Christine Perry (winwick mum) and free online to all. I'm really enjoying this simple pattern. There are four rounds of the pattern repeat and it's very easy to remember, so I can just knit and knit. They're a great mindful project because there is a 6-stitch repeat, which I can say over and over as I knit, counting through the stitches. Before you know it, I've knitted a good length and also practised my mindfulness too and I'm left feeling nice and refreshed. Own pattern. Qing Fibre yarn for main colour and selection of 20g minis from Riverknits for contrast. No disclaimer needed: All purchased (my own stash). An accidental project, which started after a mooch in my stash where I unearthed a gorgeous skein of Qing Fibre yarn which I bought in Loop, London, last year. I didn't mention it in the podcast, but Lucy of Attic24 has a great tutorial for the join-as-you-go method. I want to try this cute little pattern with a few different yarns, so watch this space. I can't wait to try it out with some super chunky yarn and some 4ply cotton from my stash. Whole Lot of Love by Lynne Rowe. 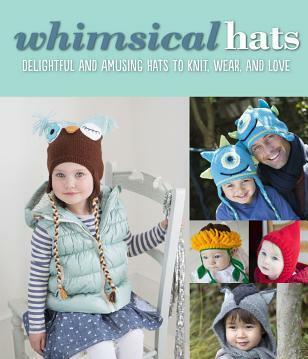 You can knit these up in a jiffy with just a few grams of yarn oddments. Turn them into a brooch or embellishment, or use them to cover holes or worn areas of clothing. They're really fun to make and I've been adding a brooch back and attaching them to birthday gifts as a usable part or the wrapping. No disclaimer needed as these are genuinely some of my favourite podcasters who keep me going when I'm knitting and crocheting. And that's my January round-up. I hope you enjoyed my podcast and do let me know if there is a specific subject that you would like me to include in a future podcast. Hello everyone. I do hope you're feeling good and your start to another new year has followed a nice smooth path so far. I've been in a bit of an emotional whirl with one thing and another and I feel as though I've been thrown into a wind tunnel and pummelled around. In particular, I've been following and digesting all of the posts and discussions about the issues of racism and inclusion (or lack of) in the knitting and crochet industry and wider community. It saddens me when my BIPOC friends and neighbours tell me that they've been the subject of racist comments. It's such a poor reflection of society. If you haven't come across the term BIPOC or POC before, the acronym refers to Black, Indigenous People of Colour, or People of Colour. 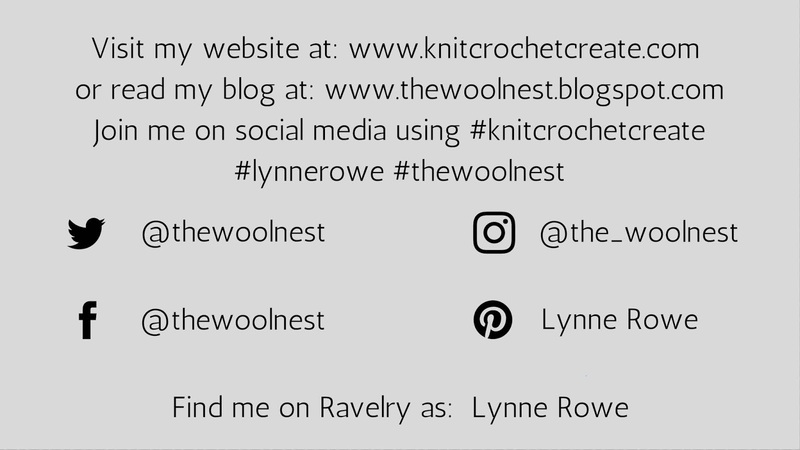 As someone who works within the knitting and crochet industry, I've been reading with interest and thinking about my experiences, and how I can make sure that I always include and welcome everyone to my small corner of the crafting world. Having worked previously in a large organisation where inclusion was top of the workplace agenda, I fully accept that the knitting and crochet sector can do a whole lot better, and we all have a part to play, including myself. I have always welcomed everyone and will continue to do so, here on my blog, on my website and my audio podcast. I will continue to feel proud to both engage with and teach people from all different communities, from any gender/ethnicity/race/religion/level of income and also including people with physical and mental disabilities. 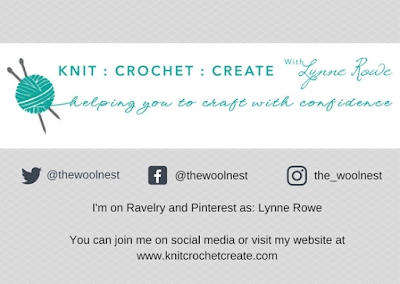 I will continue to grow and build upon my past experiences to help you all to learn and develop your knitting and crochet skills. Sometimes I have to think quickly when I'm teaching people with learning disabilities or where our first language is different and we might struggle to understand each other, or where people have physical disabilities and need to find a more comfortable way to knit or crochet. But in most cases we persevere and work through it together with a successful outcome. I've realised that knitting and crochet can surpass language barriers by using exaggerated hand movements, or repeated actions, over and over. We usually find something that works, which is always a pleasure, both to me and my pupils, and the best part is that we usually end up smiling a lot as we engage and learn new things from each other - not just about knitting and crochet, but about ourselves too. 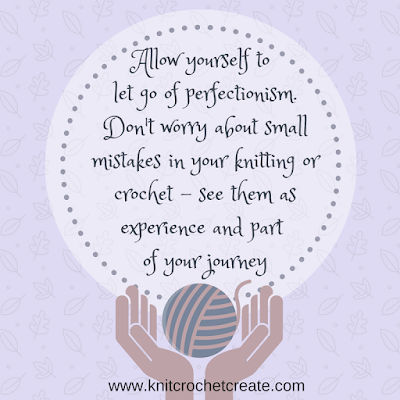 My main priority is for everyone to enjoy the process of knitting and crochet, not just for the therapeutic benefits it can bring, but also for the building of self-confidence and self-worth. Another important thing to remember about is that everyone has a different level of income, as well as time, to spend on their hobbies. Some people have lots of spare cash to spend on yarn – which is fantastic and I love to see what they’re buying and what they're making; it can be both interesting and inspiring, as well as supporting a huge area of the knitting and crochet sector, including indie dyers and wool manufacturers. But at the same time, there are many crafters who have a considerably tighter budget, as well as crafters who simply don't want their hobby to cost them a small fortune as they have other higher priorities to consider. Knitting and crochet should be a hobby that can be enjoyed by everyone without any prejudice or judgement. Over the years, I've taught many people who have lost their self-confidence for various reasons, and the most rewarding thing for me is that when they leave me after a 5 or 10 week course they are so very proud of what they have made and eager to continue with their new-found crafting skills. I know from personal experience that having nothing and losing self-confidence is really hard to deal with, but knitting and crochet can help to make people feel proud of their abilities and give them a small feeling of self-worth and achievement - just something to hold onto in times of hardship. I love that knitting and crochet can make such a change to people's lives and help improve their mental health. Whilst it doesn’t solve problems, it does make people realise that they have ability, determination and creativity hidden within, and this in turn can sometimes be pivotal in helping people turn a corner and start to re-build themselves. 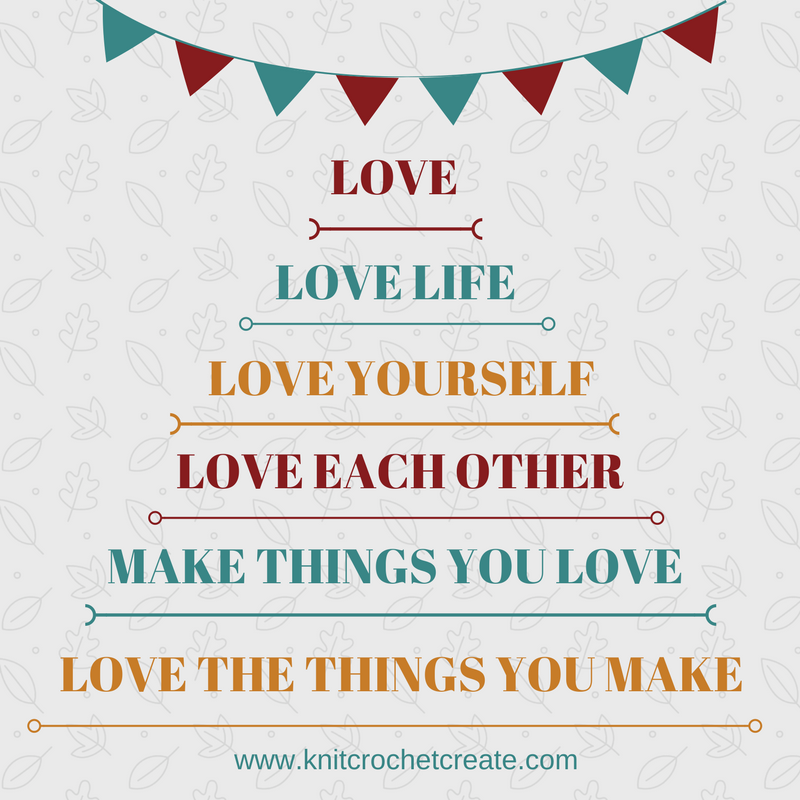 It has saddened me over the past few years that the knitting and crochet community has also become incredibly judgemental and has become somewhat overly competitive - particularly the social media side of things, and this can be off-putting to those who want to join in and celebrate their knitting and crochet love. I feel that if knitting and crochet is to remain an all-inclusive hobby then there needs to be less judgement aimed at people who cannot buy expensive yarns to use, or who simply prefer more affordable yarns, for whatever reasons. We shouldn't ask and we shouldn't judge, and we certainly shouldn't be nasty. Being made to feel that you're not good enough, or to be pushed away or excluded from a group or community can be soul destroying and there is a lot to be done within the knitting and crochet community to make sure that everyone is welcome, regardless of the yarn they use. For some crafters or potential crafters from minority groups, there are often barriers to engaging with the knitting and crochet sector, either because they are financially, physically or mentally unable, or perhaps their first language isn't necessarily that of the country that they are living in. I would love to see everyone being welcomed as an equal part of the knitting and crochet community and feel valued and proud of their achievements and contributions. In truth, we all share the same skills – we pick up our needles or hook and yarn, and want to make lovely things, either as a necessity or as a hobby. Whether we make amigurumi or colourwork jumpers, whether we make things for ourselves or for our families, whether we make gifts or knit for charities, everyone should be able to feel proud of what they’ve made and feel as though they can share their progress online, without fear of any negativity. Nobody should be made to feel bad or worry about risking criticism or judgement for sharing their knitting and crochet online. Conversely, those who love wool and love to knit and crochet with wool, should also be able to show off their makes, without being judged for spending more money than others, or for having a larger stash of yarn, or for their genuine love of wool. We're all different - we all have different priorities and different amounts to spend on our knitting and crochet activities. In essence, we're all doing the same thing and looking for the same enjoyment and fulfilment from our crafting experience and we should celebrate our creativity together. I hope we can all play our part in making our industry inclusive and fair, and free of judgement, exclusion and negativity. We won't all agree on everything, and we can agree to disagree - there's nothing wrong with discussing different opinions or sharing how we feel about things, and often it's enlightening too, but responding in a nasty or aggressive manner won't help the knitting and crochet sector to move forward in a positive way. I have so much more to think about and learn about, but please be assured that I will be doing my best to make sure that I'm inclusive, welcoming and approachable to you all. 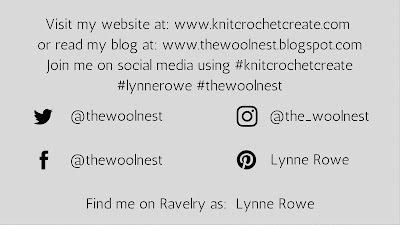 My main aim is to help everyone enjoy and celebrate the process of knitting and crochet and I will do my best to make sure that I reach a wide and varied audience. I will do more to use all qualities of yarn, and to share my makes and reviews. I will start to include a variety of yarn options for my designs, so they can be made to suit a range of budgets. I send out a couple of newsletters each month to my subscribers which, in truth, tend to be a little rushed. I always link to another designer, blogger, maker, creative influencer or indie dyer and in future I will be making sure that I spend more time to research, communicate with and showcase creatives from all sectors of society and I'll be using Jeanette Sloan's growing list of POC (people of colour) designers as a starting point (link is below). 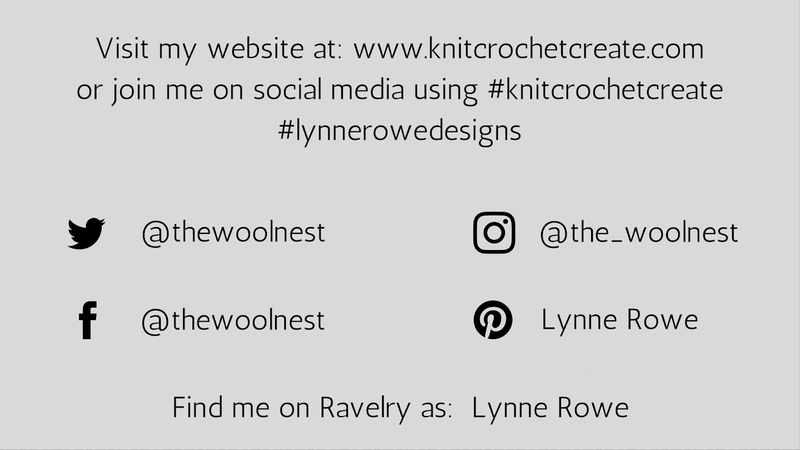 I'm looking forward to enhancing my social media feeds by following a more diverse range of designers, makers, knitters and crocheters - I've already found many amazing, inspiring and creative people that I didn't even know existed. I will be making sure that my writing style is inclusive and welcoming so that everyone feels at ease. I'm always available if you have any questions and I will always do my very best to help. I'll keep you updated with my thoughts and changes and look forward to crafting with you all in 2019. Hello lovely readers - how are you all? I hope you're enjoying the festivities of December and managing to create some handmade gifts for your friends and family. I've made a start with my own festive socks and a few simple woolly stars. These crochet stars are so cute and I see a few more being made over the coming weeks. I had a lovely November, celebrating our 25th Wedding Anniversary and also my 55th birthday (eek!!! am I really that old????). Mr. Rowe and I had a wonderful weekend on our mini cruise to Bruges. Mr. Rowe surprised me with a beautiful eternity ring with 25 diamonds - I confess I cried. We had a lovely day in Bruges, investigating the amazing architecture and stunning Cathedrals - not to mention the chocolate shops. Bruges will always be one of my favourite cities to visit. There were so many delightful window displays - although most shops had 'no photography' signs in their windows, which was a shame, as I couldn't take photos of the ones I really loved. I wasn't sure though, how much of the chocolate was truly handmade as most shops were selling the same things. But then I spotted a pretty window display (sorry no photo allowed) and felt instantly drawn into the shop. It wasn't just the handmade chocolates that had attracted me - it was the very pretty boxes that I wanted a closer look at. I was reliably informed by a lovely couple that this was the best chocolate shop in Bruges and that it's the only place they buy their chocolates from. I like it when other customers share their opinions as it really helps you to decide what to do. Along with a yummy sample, kindly offered by the owner, my mind was made up. I decided that I had to have one of those pretty boxes - they reminded me of Victorian times, and the owner told me that they were based on the very first boxes that were original used in the 1890's when they were made in silk. Just think how luxurious and intricate they would have been - like a real work of art. I imagined myself in a Jane Austin novel, sat at my window-seat, staring wistfully into the distance, as my suitor (Mr. Rowe) came galloping along the driveway on horseback to deliver my handmade chocolates in their exquisite silk box, with a special hand-written note. Can you imagine how special a Victorian lady would have felt to receive such a gift. Very special indeed. As I was stood carefully pondering which chocolates to choose, I realised that my monthly subscription to my Little Box of Crochet makes me feel exactly the same, and is no doubt why I was so drawn to this shop with it's gorgeous boxes, filled with mouth-watering goodies. Amanda Bloom is indeed a genius. She lovingly curates a beautiful box of crochet goodies and sends them out with pride to her subscribers, each month. Whilst she may not send them on horse-back (which wouldn't be the slightest bit practical), her exquisite little boxes are cram-packed full of everything you need for the monthly project, and lots more. Everything is carefully covered in pretty tissue paper, sealed with an inviting sticker for that extra-special touch. I'm always desperate to start crocheting as soon as I see that sticker! I'm always completely amazed at how everything manages to fit in the box - how is this possible? What more could a girl want!!! And not to mention the stunning artwork in the form of a postcard by the talented artist Jenny Maizels as well as the pattern booklet itself. Amanda always writes a heartfelt welcome note, plus there's 'Meet the Designer', the instructions for the main project and usually a little extra project too, and more. This month there is a little jacket for Louis the wooden sheep. I'm sure you'll agree that Amanda's Little Box of Crochet is the perfect extra-special 'pick-me-up' each month, not to mention great value for money. A little box of joy, just like my delicious chocolate box. I can't wait to get started on my Festive Mandala over my Christmas break whilst munching on my handmade chocolates. Do you have something craft planned for the festive season? I'd love to hear more about your plans. No disclaimer needed as all of the items above are my own purchases. Morning everyone. It's Sunday morning here in the UK and it's unusually bright for November, with clear blue skies and no rain. It feels more like a late Summer's day than the run up to Christmas. Let's hope it continues. Last night, I managed to finish one of my self striping socks and I made a start on the second sock straight away. I sat happily knitting whilst watching Strictly Come Dancing, only to realise (once I'd finished the cuff) that I had knitted the wrong cuff. I usually knit a 2 x 2 rib for my sock cuffs, but because I'm knitting Emma Potter's Dotty Socks, I decided to tweak the cuff to match the pattern, with a 3 x 1 rib. Oh no - all that wasted knitted. But I didn't unravel the cuff, I simply cut off the yarn and I'll keep it for another pair at some point. So off I set again, this time knitting the correct cuff. I love a 3 x 1 cuff as I like the wider, plain band that is created. I think I'll use it a lot more in my sock knitting. I've had a few questions about where to change colour for the cuff so I thought it would be good to share my method, for a standard heel flap. First of all, for a top-down cuff, knit to the point of your heel, following your pattern, but on the last round of knitting, stop knitting when half of your heel stitches are left, before the stitch marker. So for my socks, with a 64-stitch sock, my full heel stitches are 32 stitches. Half of 32 is 16, therefore I leave 16 stitches unworked, before the end of the last leg round. Next, change colour and using a double-pointed needle, knit the last 16 stitches of the round in your contrast yarn. Alternatively, you can twist the contrast yarn around the main yarn before you start knitting, or you could try the Russian Join, which doesn't leave any ends to weave in (link is at end of post). Next, remove your stitch marker and knit the second half of your heel stitches (for me this is another 16 stitches). Turn your work and using a second double-pointed needle, purl all of your heel stitches. Turn and continue working on these stitches to knit the heel flap and turn, according to your pattern. You will now have two yarns attached to your sock - the main yarn which is located at the base of the heel and the contrast yarn which is attached to your heel. For the first option, you can return to your main yarn and start your gusset from that point. Start by picking up stitches along heel (according to your pattern), then knit across the base of the heel, then pick up the stitches along next side of the heel, place marker, and finally, knit across the instep stitches, place marker (the markers are used for the gusset decreasing section). Cut off your contrast yarn and leave enough yarn to weave in later. Now continue decreasing as per your pattern and knit your foot. But for me, I don't like to do this with a self-striping yarn. I find that the main problem area with self-striping yarn is the gusset. This is because when you have picked up your gusset/instep stitches around your heel, you have about 18-20 more stitches than you originally had for your leg. Therefore, your stripes will be shorted in depth than the stripes on your leg and foot, because you have more stitches to knit on each round. If your stripes are really deep then it won't be too noticeable. But if your stripes are only around 4 rounds deep, then it will be quite noticeable. I'm not a huge fan of my stripes going off-piste around the instep, so I use my 'cut and paste' method by piecing in pieces of yarn of the same colour stripe and if you can master the Russian Join then you won't have lots of yarn to weave in. So when I've finished shaping my heel, I start the pick-up round with my contrast yarn, first knitting across the heel stitches with my short circulars. Next, I pick up and knit up one side of the heel. Then I place a marker and knit across the instep stitches, place another marker and pick up and knit along the next side of the heel and passing the main yarn as I do this. Then still using my contrast yarn, I continue with the next round until I reach the main yarn for the second time, at which point I stop and change back to the main yarn and cut off the contrast yarn. By using the contrast yarn to pick up the gusset stitches and knit part of the next round, it gives you the extra couple of rounds across the instep section, which you need to keep the stripe the same depth as the leg stripes. Then, for the next three or four stripes (until I have finished the decreasing section of the gusset), I add extra little strips of yarn to make each subsequent stripe the correct depth (because each stripe of the gusset is1 round short per stripe). Whilst it may seem fiddly, I like how this creates the perfect stripes and makes me happier with my socks. You can then knit the leg, following your pattern, and always leave in the gusset stitch markers so that you know where to start your toe decreasing. Once you reach the length required, you can change colour again to start your toes and follow your pattern for the correct instructions. You may need to adjust the starting point of your toes, depending on where your stripes finish. So for this sock, the last round of my leg stripe was Red, which means that my toe section looks a little longer than usual. 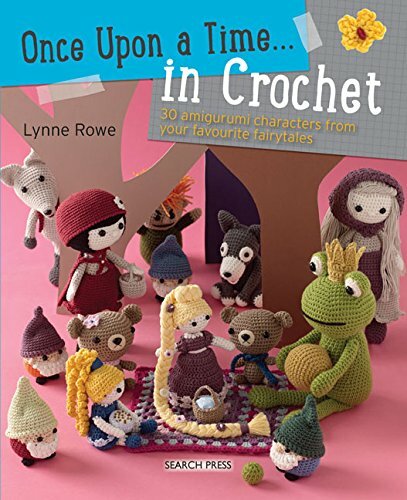 This months prize is a fabulous book by The Loveliest Yarn Company, containing lots of amazing mini sock patterns for your Sockmas socks, along with a canvas tote bag and a few extras from me.